The Quilt Fair is a huge exhibition of Textile Art – mostly Quilts and had a number of themes and categories. There were categories for prizes e.g. best framed work. There were other categories of Traditional Quilts, Quilted accessories etc. 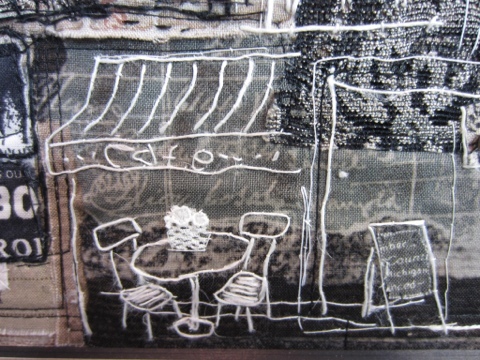 I concentrated on the framed textiles mainly. The quilts were well-lit but some lights meant it was difficult to take photos due to the glare. Is there enough explanation of the exhibits? All explanations were in Japanese, which I cannot read, so I am unable to answer this question! Is it visually stimulating and interesting? I found some of the quilts visually stimulating but overall, the Fair was held in a huge arena with no atmosphere and there were huge crowds, which detracted from viewing the pieces. Luckily I was able to get up close to my favourites and admire the detail. 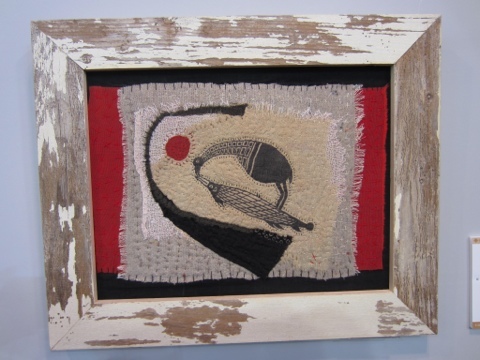 I concentrated on the framed pieces and those, which were hand-sewn or made of old Japanese textiles. Now choose three exhibits and look at each in more depth. This was my favourite piece of textile art at the Quilt Fair. I was drawn to the colour and lines initially as well as the range of fabrics used. On closer inspection, I was fascinated by the stitching. I would love to have a go at ‘drawing with thread’. When was the piece made and by whom? 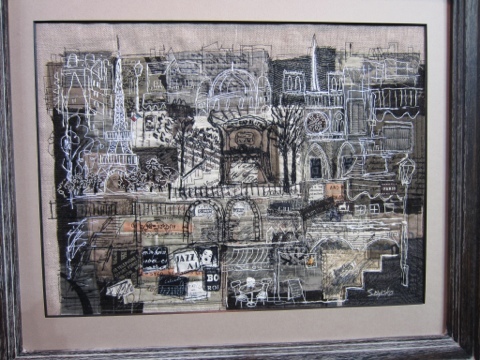 The Artist is Sayoko Asano and she won 3rd prize in the Framed Quilt Category. I couldn’t determine when it was made but I imagine in the last year. 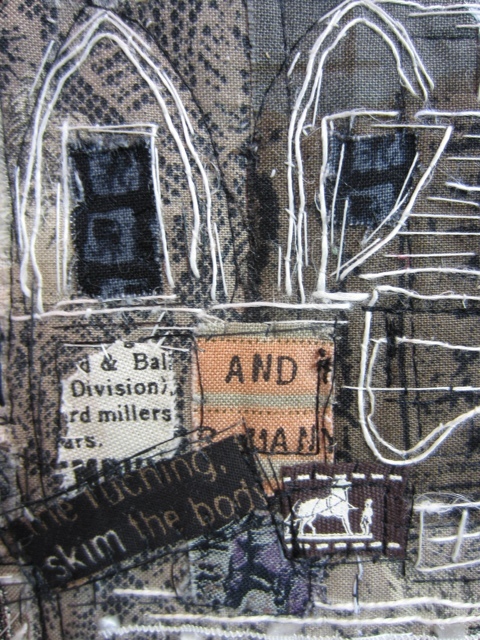 The background is a mixture of canvas and a variety of cottons, some of which have been printed or written on. Other pieces of fabric have been machine-appliquéd in dark threads. Then the detail has been hand-sewn in white thread. Can you identify the techniques used? I can see piecing of fabrics together by machine-stitiching using a running stitch. 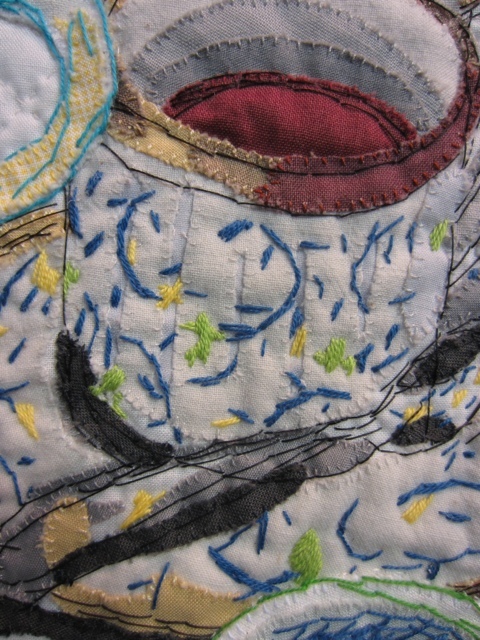 Other fabrics including netting have been appliquéd using a range of different stitches. I can see different printing techniques’ perhaps batik and screen-printing. Is the work representational or abstract? It is representational. 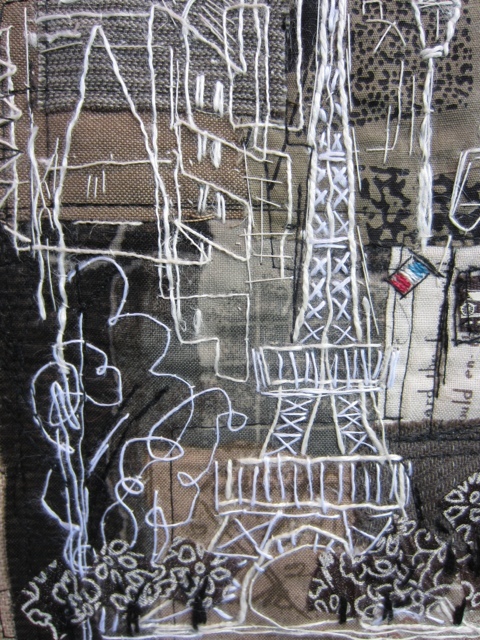 It represents Paris scenes and landmarks. Where did the designer derive their inspiration? How would you describe it – decorative, expressive, functional or symbolic? I think it is decorative, expressive and symbolic. The artist has created a very attractive work which has lots to inspire, interest and every time I look at it, my eye gets drawn to a different scene. It captures a feeling of being in Paris by including scenes and large monuments all layered but not to scale. What qualities do you like or dislike about the piece? I like the way the white stitching stands out to show scenes but behind the stitching are many other layers. 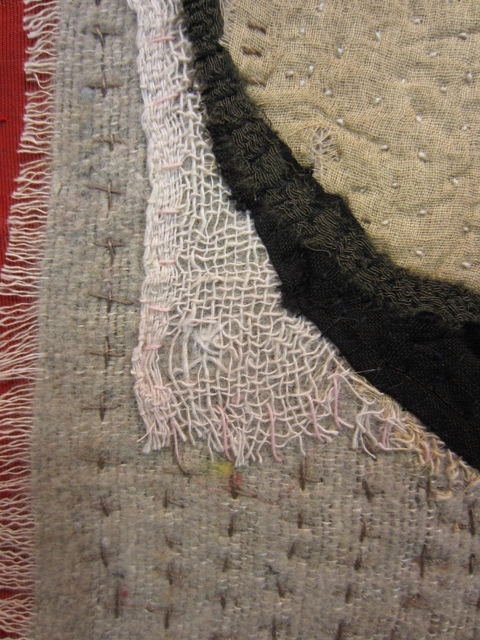 The range of textiles and stitching used makes the piece very textural and tactile, giving a 3D look. I find the natural and neutral colours used very pleasing, invoking gloomy weather and city colours but it is lightened and enlivened by the use of white. I can honestly say there is nothing I dislike about the piece. 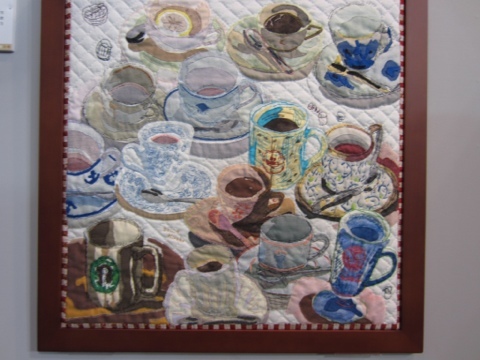 The next exhibit I chose is an appliquéd textile art piece depicting a table of cups and saucers. It was not one of my favourites but I found the techniques used very interesting and worthy of discussion. The label was in Japanese so I can’t say! Cotton pieces in a variety of colours appliquéd onto white cotton backing by hand-stitching. Hand-stitched appliqué over which a variety of stitches have been hand-sewn for the detail. I imagine the designer enjoys tea and using a range of tea cups and saucers. I would describe it as purely decorative. – a period of fashion? This piece isn’t really ‘my cup of tea’ ha ha! I don’t particularly like the choice of subject or the composition and I find the different colours used jarring – they don’t go well together. 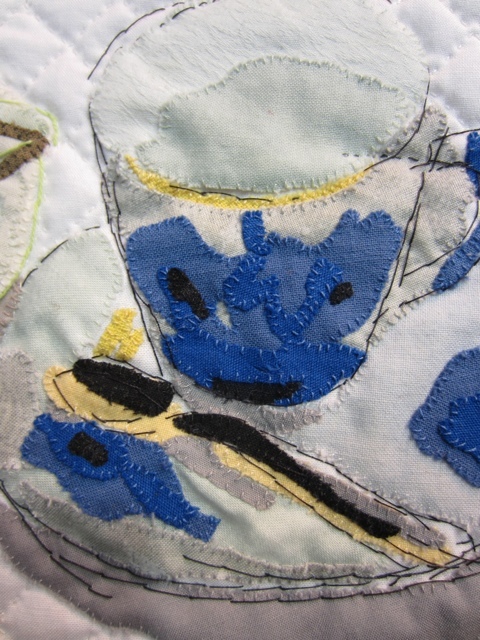 I chose the piece as I found it interesting how the designer used the appliquéd pieces to give the cups perspective and therefore a 3D appearance. I also liked the hand-stitching. The piece was a lot more interesting for my close-up. I like the two images I am showing of the individual cups, which are more appealing to me than the whole picture. Now here is a piece I really like! 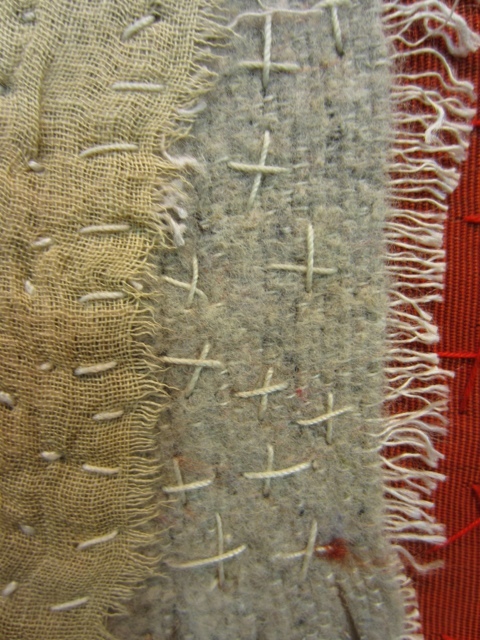 Layers of different fabrics, including hessian, hemp, muslin and cotton. A piece of cotton printed with a design of a bird with a fish is the top layer. Again, layers of fabric hand-stitched into layers. How would you describe – decorative, expressive, functional or symbolic? I think it is decorative, expressive and perhaps symbolic. I love the use of colour, the composition, the framing. I like the simplicity. It has the feeling of a cave painting or tribal piece of Art. It looks old as I suspect the textiles used are repurposed but is a contemporary piece.